Systema releases this full training weapon kit of M4A1, it means this kit which includes all parts need to be assembled. Full metal body without trade mark, english assembly instruction included, suitable for experienced user. 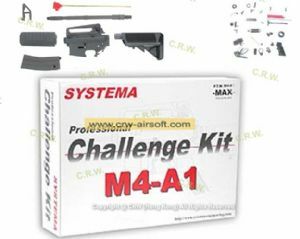 If you want to try systema high quality AEG series and have confidence to assemble this kit, we recommend you get this kit and save a lot compare with buying a finished M4. This version Systema Professional Training Weapon guns feature a whole a whole array of improvements over the older versions. The control board and ECU have had comprehensive full-scale revisions and a new addition to this model is an LED feature to the S.E.C.U., which indicates the present state of the PTW during engagement. It may sound like a minor thing, but it can be used to determine the condition of the PTW; when to change the battery, to any serious issues with the PTW. -Improved Burst Function - instead one trigger pull releasing 3 BBs, with the right control, in burst mode, you can release 1 or 2 BBs. -Changes to the Trigger Switch - 2 Stage Trigger; by using an even shorter stroke, the PTW mimics the trigger travel of a real firearm. -Improved longevity of the FET, with a reduced power consumption, improving the efficienct by three times. -Incorporation of a Tight Inner Barrel for all models - Systema have decided to adopt the 6.04mm inner barrel for all models. -Changes to the Air Seal Packing - changed from conventional air seal packing to an O-Ring.